At Green Key Village, we believe that life should be nothing but happy. That’s why our tropical-inspired, environmentally-friendly living spaces in sunny Lady Lake are designed with the kind of care and quality that turns a house into a home, sweet, home. We’re excited to introduce you to the couple who were our very first homeowners at Green Key Village, Dave and Jaci Cwik! The Cwik’s embody our values of easy and smart living, and they’re loving their life here. As our “Mayor” and “Mrs. Mayor,” we couldn’t be happier to have these homeowners in our community. Dave and Jaci purchased an Eaton model with modifications, so they have all the room they need to feel comfortable while also being able to have their 2 daughters and 3 grandchildren over for visits. 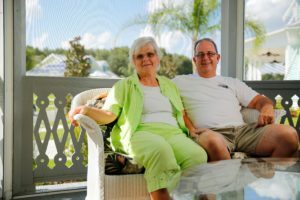 With a warm and welcoming gazebo-style front porch, the Cwik’s love to relax and enjoy the sunshine with their family. As active members of the community, Dave and Jaci formed the garden club, and work hard in the planting and growing process. One of their favorite things to do is share their delicious produce with door to door delivery! When you’re here, you always know that a tasty treat and a friend are just around the corner. On any given Tuesday or Thursday, you can also find Dave monitoring the chemicals in the community pool, and supporting neighbors with any help that’s needed. Dave also writes and distributes a monthly newsletter to all homeowners, so everyone’s kept in-the-know about the exciting happenings in the community. Originally from Michigan, Dave and Jaci lived in the Villages for 18 years before moving to Green Key Village. Here, they get to explore their passions, which include sewing, woodworking, and baking, and live a leisurely life in the comfort of their maintenance-free home. We’re so happy to have you, Dave and Jaci! Thank you for being such wonderful neighbors and showing what it means to live the Green Key way. For more information on our homes, please visit our page, or give us a call at 352-314-0126. We can’t wait to introduce you to your new neighbors, Dave and Jaci!